There is a certain archetype in professional sports that often flies under the radar, an elite group of individuals who are rarer than Lil B eating pink steak. That’s right folks, I’m talking about the ginger athlete! Now obviously, The Society talks strictly hoops, so we’ve excavated the NBA archives and picked our First and Second Team All-Ginger squads*. So sit back, relax, and don’t get too hot-headed as we take a look at the raddest of the reds. *All of these players are either fully, partially, or artificially red-headed. Who better to run the point on First-Team Ginger than the former king of Cleveland, Mark Price? This guy gave MJ and the Bulls fits in the late 80’s/early 90’s. His ability to stretch the floor and efficient scoring made him a tough guard. At one point or another, we’ve all tried to trump our opponent in H-O-R-S-E by hoisting up the classic “granny shot” – Rick Barry is the grandpa of the granny, and he made it look too easy. In addition to leading the Golden State Warriors to their lone NBA title, Barry fathers three sons who played professional basketball: Brent, Jon, and Scooter. I know it seems a little funky to place Mr. Lob City at SF, but these All-NBA lists are always a stretch position-wise. Anyhow, everyone and their great aunt’s plumber knows how freakish Blake can be above the rim. Oh, he has a jumper now, too? Buenos noches. A controversial choice for a controversial player. “The Worm” isn’t a natural redhead, but he occasionally dyed his chameleon-esque hair as such. While he’s renowned for donning wedding dresses, wrestling Karl Malone, and hanging out with Kim Jong-un, he is still regarded as one of the most prolific rebounders and defenders of all-time. I was not alive circa Woodstock, so my resounding memory of Bill is his excessive adoration for Shaq (“Throw it down big man, throw it down!”). However, there was a time when Walton could flat-out ball on both ends of the court. His uncanny passing ability for a big man and dominant defense helped the Trailblazers become relevant. He led Portland to their first title, but sadly succumbed to foot injuries that plagued the rest of his career. 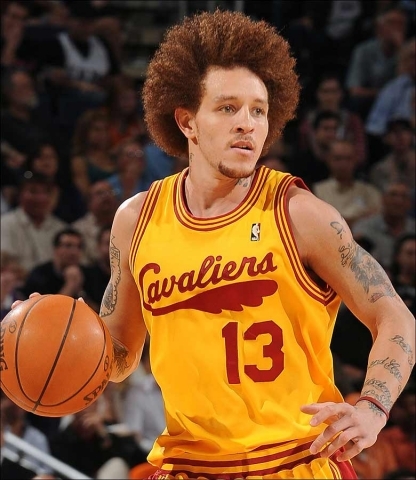 Ridnour is the consummate NBA journeyman, but don’t let his frequent flyer miles overshadow his G-A-M-E. “Frodo” can drain the long-ball from downtown Middle-Earth, in addition to being quite the facilitator on offense. Perhaps best known for (allegedly) hooking up with Lebron’s mother, Mr. West is adept at scoring on the court as well. He is a career 45% shooter with killer handles and a solid defender. ‘Lonte is currently playing overseas in China. Van Horn is of the sneaky ginger variety; his red hair is only noticeable upon closer inspection, but there is nothing “close” about his game. The Chandler Parsons before Chandler Parsons, Kool Keith was lethal from long-range and had the athleticism to finish at the cup. 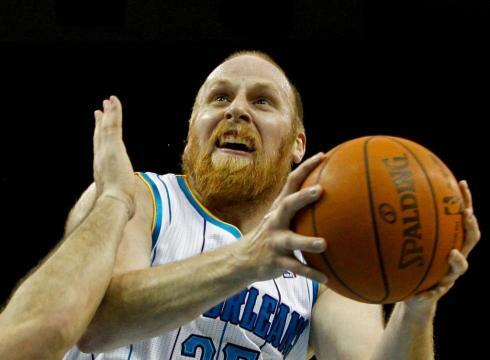 Ah, the anachronistic caveman, Chris Kaman. He’s carved out a pretty solid career for himself as a reliable low-post scorer and rebounder. If Encino Man 2 ever drops, Kaman deserves the lead. Luc is…well…long. The 7’2” big man from Australia is best-known for his years in Chicago, helping the Bullies win three titles in the late 90’s. Longley was not a premier “down under” dandy, but nonetheless a serviceable big and stout rim protector. That’s it for our list. Who is on your All-Ginger team? Let us know in the comments!